Learn useful homestay phrases through a story! Erina Adachi is from Nagoya. She is nineteen. She is a university student. She studies English at university. It is August. Erina is travelling to New Zealand. She will stay with a New Zealand family. She will go to a language school for two weeks. Erina wants to speak a lot of English. She also wants to make new friends and to go sightseeing. She is very excited. 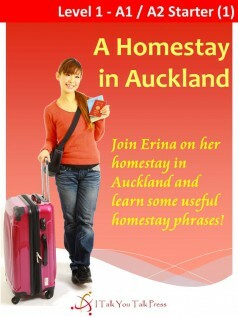 Join Erina on her homestay and learn some useful phrases!